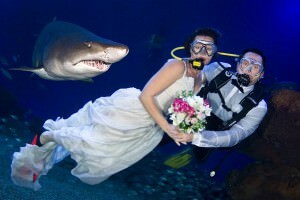 Are you a diver and is your dream to say “i do” in your favorite element? How would you like to have a collection of sharks, eagles rays, tuna and moray eels as your witnesses, along with the usual inhabitants of the deep? The Palma Aquarium is the perfect setting for this kind of wedding. Your guests can witness the ceremony through a giant panoramic window, while relaxing with a glass of champagne!